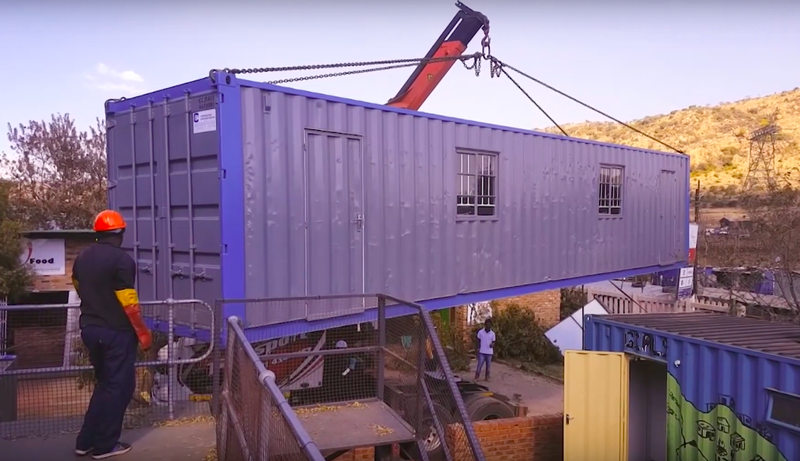 The container school provides the best possible education, extra murals, food and support to its learners. BACKGROUND: Imagine the worst part of Mamelodi to live in: Alaska Informal Settlement - abject poverty, a high jobless rate and crime rate, minimum to no services and shack upon shack. That’s where you will find the Viva Village Independent School. That’s exactly where CEO and founder, Meleney Kriel wanted the school to be, to provide a refuge and haven for the young minds, who have to, by no choice of their own, grow up in this environment. The container school provides the best possible education, extra murals, food and support to its learners. Viva Village also provides safety, peace and hope to the young students. The school started out as a pre-school in 2007, but 11-year on has grown to also provide foundation phase education. Next year, they want to start their Grade 5 class. They already have the container classroom, now they need to kit it out for the 20 Grade 5 learners enrolled for 2019. SPONSORING: Roman’s Pizza will support the new class room expansion at Viva Village school with a donation of R35 000,00 towards desks, chairs, a book case, text books and other necessities to make learning possible for the schools’ first Grade 5 learners! Please would you consider the Viva Village Independent School as a recipient for much needed funding this Festive Season? Established in the Alaska Informal Settlement of Mamelodi Pretoria, the school is built from refurbished shipping containers and offers exceptional education to the children of this informal settlement. The school was founded in 2013 by Mel Kriel and opens a new grade every year as the children progress. 2019 will see the establishment of the first Grade 5 class, with 20 learners in the class. If Good Morning Angels could consider sponsoring the desks and chairs for this class room as well as a book case. Also needed are all the learning materials ie text books, work books, stationery and readers. Quotations from vendors for all items can be supplied and the sponsor can receive a Section 18A Tax Certificate. A budget between R30 000 and R35 000 would be adequate to cover the need. The school is run by The Viva Foundation, a highly credible NGO which has operated in the informal settlement since 2009. The Viva Foundation of South Africa was founded in 2007 out of a concern about the effects of poverty on human beings. The Vision of the Viva Foundation is to be instrumental in the transformation of informal settlements and other high-priority poverty areas into stable and economically viable communities that provide young and old with opportunities for education, employment, business and recreation. The Mission of the Viva Foundation is to establish service hubs within informal settlements from where the organisation and its partners can meet the felt- and expressed needs of the surrounding community. The Viva Village in the Alaska Informal Settlement, Mamelodi East, Gauteng, established in 2009, is the only service provider in the settlement and has become the very heart of the community. Its successes and lessons learnt, proves invaluable in providing a workable model that is reproducible and adaptable to other areas. The Viva Kids Early Learning Centre was established in 2010 and has grown from humble beginnings to a self-sufficient ECD care facility. Children from Viva Kids ‘graduate’ to the Viva Village Independent School. This way the Viva Foundation is able to provide foundational care and education to vulnerable children, from 4 months of age, until puberty. Enterprise Development programmes have been offered since 2011 and the Sexual Violence Prevention & Response programme was launched in 2012. Viva Kids introduces the SOUNS literacy programme from age 2 and even before that, the babies and toddlers are introduced to English reading and language skills. Quality care and an Early Children Development programme based on a holistic approach to individual- and social skills development is offered. The Viva Kids incorporates a jungle gym into the structures to optimise large motor skills and spacial development. The Viva Village Independent School was launched in 2014 with 30 children in Grade R (Age 6) with the aim to add a Grade per year until a fully-fledged primary school (Grade R – Grade 7) is established. In 2016 the school was able to add a Computer Lab and E-Learning to its curriculum and in 2017 music and art was introduced bi-weekly with designated music and art teachers. The Stations of Learning concept was also introduced with Literacy, Numeracy, Social Sciences, Life Skills/Art/Music and the Computer Lab as stations. The teachers move with their class to the relevant station, where the décor and learning environment are optimised to facilitate learning in those disciplines. The ECD and school provide an option to extremely underprivileged and vulnerable families, namely a fair and equal start in life. The stakeholders and partners believe that given equal opportunities, all children will rise to their full potential and excel in their individuality with volition.